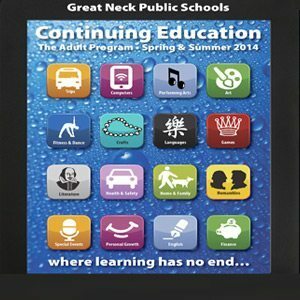 The Great Neck Public Schools Adult Program Spring/Summer catalog will soon arrive in mailboxes. Choose from an extensive array of classes, special events, and trips, offered mornings, afternoons, evenings, and weekends. Most classes meet at the Cumberland Adult Center, 30 Cumberland Ave. (half block south of Northern Blvd., off Lakeville Road). The tablet on the catalog cover illustrates the importance we place on keeping you tech- and computer-savvy. Apps, smart phones, Web Site development, animation, digital camera, social media, PC and Mac software training, Cloud, iPad, and one-on-one personal training are just some of our extensive computer offerings. Interested in reading and writing? Popular classes include: Poetry Writing, Write Your Heart Out, World Literature, Shakespeare, Latin and Greek Roots, and the Adult Program Book Club. New courses include: Grammar & Punctuation Refresher; ESOL: Reading, Writing, Listening & Conversation Skills; and Writing Concise Prose. We take care of it all: unique venues, docent-led tours, gourmet meals, and travel by luxury coach buses. Visit places of interest in New York’s five boroughs, Connecticut, New Jersey, Long Island, and Pennsylvania. Upcoming venues include: Tenement Museum, Barnes Foundation, Yale University Art Gallery, a taping of The Chew (ABC’s talk/cooking show), Boscobel, Landmarks of Jewish Harlem, Culinary Institute, LI Wine Country, and Yankee Stadium. High school students can choose from ACT/SAT Preparation, Driver Ed, and most of the late-afternoon, evening, and Saturday courses. There are also chess training, Chinese language, and Parent/Grandparent & Child classes for younger children. Socialize, make new friends, and learn a skill through games classes: Bridge, Canasta (enjoy an afternoon of canasta at the Jolly Fisherman), Chess, and Mah Jongg. Choose from over 40 fine arts and crafts courses: beading, collage, drawing, fused glass, handweaving, jewelry making, metal clay, oil painting, pastels, patchwork, pottery, pressed flowers, printmaking, silversmithing, stone & clay sculpture, and watercolor. The Adult Program offers instruction in: Chinese (for adults and children), French, Hebrew, Italian, Russian, Sign Language, Spanish, and Yiddish. Serious Singing, Singing for Fun, Cabaret Workshop, and piano instruction provide musical outlets in relaxed, informal settings. Performing arts-appreciation classes include: Great Moments in Opera, Jewish Composers & the Hollywood Musical, Great Singers & Composers of Popular Music, and Golden Age of TV Drama. Keep fit with over 30 fitness and dance courses: Zumba, Zumba Gold, line dancing, Pilates, body workout, low-impact aerobics, hand-weight training, cardio-fit, swimnastics, Qi Gong, Tai Chi, meditation, yoga, seated exercise, Hatha Yoga, ballroom dancing, and dance movement for those with Parkinson’s Disease. Enjoy the educational and practical: CPR, Fly without Fear, hearing loss, nutrition, financial planning, dog training, and defensive driving. Register conveniently by phone at 516 441-4940), or online at www.greatneckadulted.org, where you can also view the entire catalog. Join us this Spring and Summer. We look forward to welcoming you!